These caramels may not be made with Irish Whiskey, but this is my contribution to St. Patrick's Day today!! I've been wanting to make caramels for a while, so the other day I just bit the bullet and went for it. I thought these Salted Whiskey Caramels were perfect for my first time caramel making adventure. I had had them before when my good friend, So How's it Taste?, brought them to work a couple of years ago. Anything with whiskey/bourbon has got to be good, right? If you need help with that one, the answer is YES!! These caramels are fantastic! I thought they were pretty simple to make and I loved the end result -- a smooth, chewy sweet caramel with a slight crunch from the sea salt. You can use any whiskey/bourbon that you desire. I used Jack Daniel's Tennessee Honey. I think it's sweetness worked well in the caramels and I had it on hand since it's my new favorite. Recipe via So How's It Taste? Line a 9-inch square pan with parchment, foil, or wax paper and allow the paper to drape over the two sides, so you can use them as handles. Spray it lightly with cooking spray. Set aside. In a medium size saucepan, heat the butter, whipping cream, whiskey, vanilla extract and 1/4 teaspoon of salt to boiling, stirring frequently. Remove from the heat; set aside. In a large size saucepan, mix the sugar, corn syrup, and water together. Heat the mixture to boiling over a medium-high heat. DO NOT STIR. Boil until the sugar turns to a nice warm golden brown and reaches 310 degrees F.
When the sugar mixture is done, turn off the heat and SLOWLY add the cream mixture to the sugar mixture. Be very careful - it will bubble up like crazy. Turn the heat down to a medium-low heat and continue cooking for about 10 minutes, until the mixture reaches 248 degrees F (firm ball stage) on a candy thermometer. Pour the caramel into the pan and let cool for 10 minutes. Sprinkle with the extra course salt and then let cool completely. Peel away the paper lining of the pan and using a sharp knife, cut into squares, or do like I did and mold into little caramel logs. Wrap each piece in parchment or wax paper twisting the sides closed. I got about 50 pieces of caramel out of this recipe, but it will totally differ depending on what size you cut your pieces, plus I couldn't keep "taste testing" them!!! Haha, well, I contributed nothing to this holiday, so Irish or not, whiskey qualifies as festive in my book! And I don't think anyone will be able to complain because their mouths will be so full of caramel! These are all goodness. Yum! I love salted caramel, and whiskey in there?! So delicious. 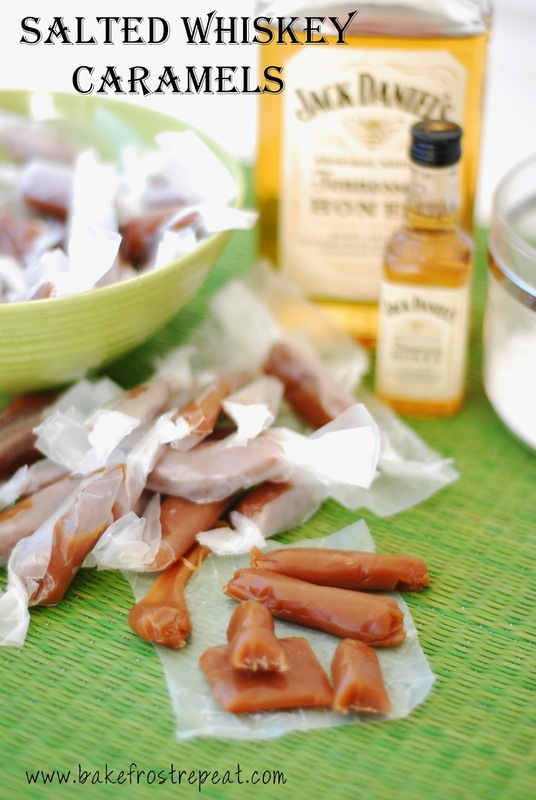 I have never made my own caramels either, but putting whiskey in them makes me extra motivated to try! Love this recipe, Shannon!